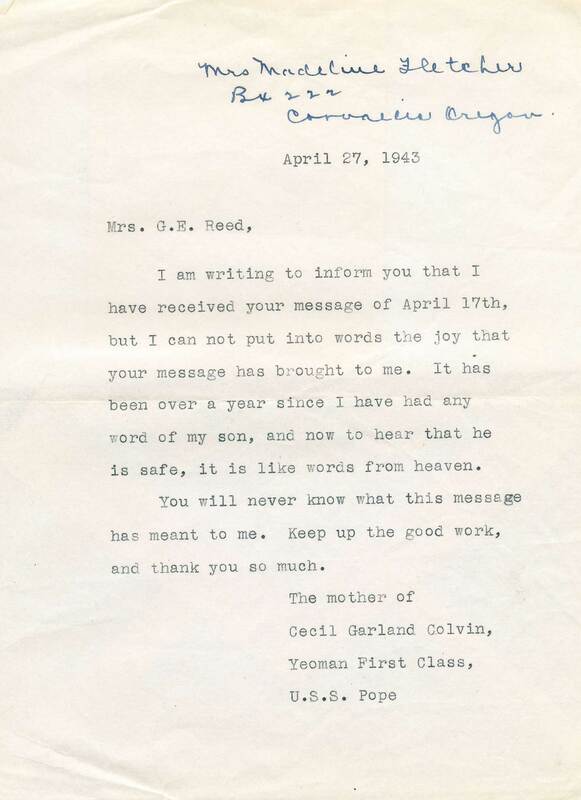 Yeoman First Class Cecil Garland Colvin (known as Bobbie) was the son of Madeline Fletcher and a step-son of Ray Fletcher. Most of his childhood years were spent on the Pringle Ranch (Dundy County Nebraska). He attended school in Parks and Benkelman. Bobbie joined the Navy in 1936. In March 1942 he fell into Japanese hands when his ship, the USS Pope, a destroyer with the USS Houston, was sunk on March 1, 1942 in the Java Sea. After three days afloat, he was captured with other surviving crew members by a Japanese destroyer, and (was) taken ashore in Macassar, Celebes. In June of 1944, they were moved to another camp south of Macassar, where all living conditions — housing, accommodations, food and sanitary facilities — were exceedingly poor and the health and general welfare of the men inevitably suffered. On Jan. 19, 1945, Bobbie was taken to the Camp Hospital, and on April 8, 1945 he died of malnutrition, starvation and diseases of the camp. Lt. A.J. Fisher, of the Navy who was with Bobbie wrote of him, “. . . Bobbie was a real shipmate. In camp he was the librarian for our outfit and through his efforts did much to keep up our morale. He often talked of his plans to attend the University in Oregon . . . He was at all times a credit to his home and his country . . .” Bobbie’s sister, Marian Babicky, has attended several of the Ex-POW reunions, and has become personally acquainted with some of the members of his crew who survived the POW camp. 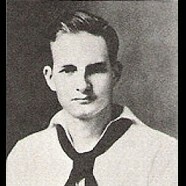 Bobbie enlisted in the US Navy on October 12, 1937 and on December 22, 1938 was stationed on the USS Marblehead, CL12. His final assignment was on the USS Pope. It was sunk by the Japanese on March 1, 1942 in the Java Sea. Bobbie died of complications from Bacillic Dysentery and Pellagra at Makasser Prison Camp on the island of Celebes located in the Java Sea.